Anna R. Johnson1, Sarah Kimball, MD2, Sherise Epstein, MD, MPH1, Abram Recht, MD1, Bao N. Tran, MD3, Samuel J. Lin, MD MBA FACS1, Bernard T. Lee, MD MBA MPH FACS1, Ted A. James, MD MS1, Dhruv Singhal, MD1. 1Beth Israel Deaconess Medical Center, BOSTON, MA, USA, 2Baylor Scott and White Health, Temple, TX, USA, 3New Jersey Medical School, Newark, NJ, USA. Background: Extremity lymphedema (LE) is a feared complication of breast cancer treatment. The objective of this study was to summarize the evidence of how lymphedema incidence after axillary lymph node dissection (ALND) is affected by regional lymph node radiation therapy (RLNR) and/or the Lymphatic Microsurgical Preventive Healing Approach (LYMPHA). Methods: We searched PubMed, Embase, Web of Science, and the Cochrane library for studies describing the incidence of lymphedema among breast cancer patients undergoing ALND alone or ALND and RLNR, with or without LYMPHA without any date restrictions or limitations on study design or type. Results: A total of 1,374 publications were reviewed, 22 of which met our inclusion criteria. These studies included 4,742 patients, 906 of whom had lymphedema. The pooled cumulative incidence of lymphedema was 11.9% in the ALND group. The incidence of lymphedema was significantly higher when RLNR was administered with ALND (increase of 14.1%, p <0.001). The incidence of lymphedema was significantly lower when LYMPHA was performed with an ALND (decrease of 9.8%, p=0.038). 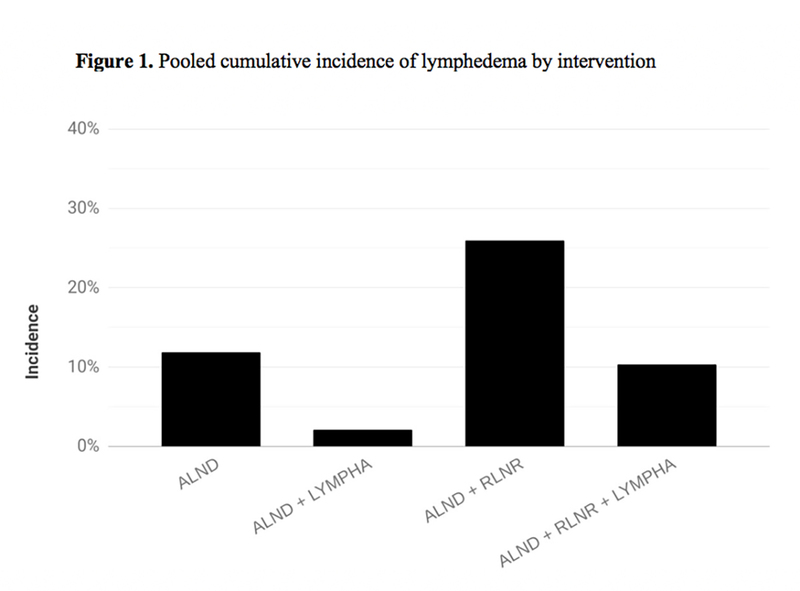 LYMPHA after ALND with RLNR significantly reduced the incidence of lymphedema by 15.7% (p=0.005). Conclusion: RLNR adversely impacts the risk of lymphedema development after ALND. LYMPHA appears to greatly reduce the incidence of lymphedema in patients undergoing ALND with or without RLNR. Further investigation with larger sample sizes is warranted to evaluate the potential role of LYMPHA in these high-risk patients.